Quintessence journals are highly valued as much for the timeliness and accuracy of their information as for their exceptional esthetic qualities. Peer reviewed by experts, each one provides relevant, current information for dental professionals and students alike. 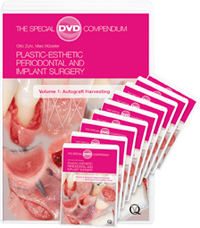 Quintessence offers high-quality dental books covering a wide range of significant topics. Visit often to explore our continuously updated listing of the newest titles, as well as our many now-classic texts. Quintessence products meet all your professional needs! Our CD-ROMs and DVDs are produced with the same commitment to quality that characterizes our books and journals. Our newest products are shown here, and you can explore our complete multimedia library with our comprehensive search function.